Our secluded and cozy cabin, Carra's Cabin is furnished with one bedroom and a loft over the kitchen (kids just love it!). 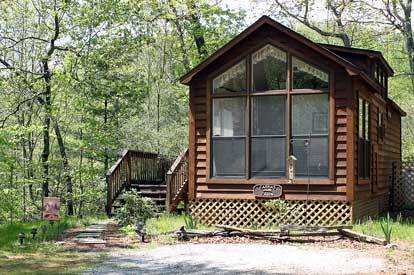 Featuring a private Hot Tub, as well as lounging chairs on the deck make this one of our favorite cabins. There is a queen size bed in the lower level bedroom, while the loft is outfitted with a queen size mattress. A full size bathroom and modern kitchen accommodations await you, with completely stocked cooking utensils, towels, and bedding. Please click here to see a images of the interior and exterior of Carra's Cabin.